According to WHO, ICD is “the standard diagnostic tool for epidemiology, health management and clinical purposes. These ICD codes are used for reporting medical diagnoses and Healthcare providers get reimbursement from the patient’s health insurance provider based on assigned code for his diagnosis. The basic ICD codes were developed by World Health Organization. In the field of Medical coding ICD 9 CM (International Classification 9th Revision, Clinical Modification) has been replaced by ICD 10 CM (International Classification 10th Revision, Clinical Modification) from August 31st 2015, because of Disease classification requirement and due to addition of more and more disease conditions within last 20 years in the Healthcare industry. 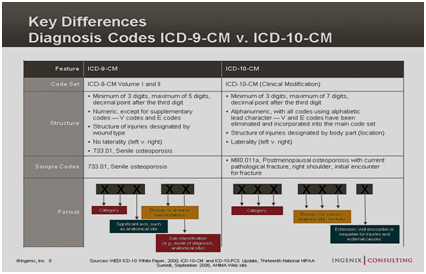 ICD 9 CM codes are numeric or alpha numeric and having 5 characters, while ICD 10 CM codes are all alphanumeric and having 7 character. Because of increased characters it can include more clinical conditions with much more specifications. The U.S.-specific ICD-10-CM has been developed for all health care treatment centers in the U.S. in coordinated task by American Hospital Association American Health Information Management, Center for Medicare and Medicaid Services & National Center for Health Statistics and is directly tied to reimbursement for the provided services. It is very important for Healthcare Providers to be precise and comprehensive in deciding and documenting diagnosis so that their coder can assign code with maximum specification and which can be perfectly reimbursed by Health Insurance companies. Now with the implementation of ICD 10 CM where all the code descriptions are given in much more detail and specified manner; it is very important for biller to understand Medical Terminology in detailed to avoid assigning wrong code for the given diagnosis. Do you want to work in a medical facility assisting doctors and taking care of others? Are you concerned this job description only fits a nurse? Well it doesn’t! You’ll be happy to hear that helping to heal the sick and injured person isn’t strictly limited to doctors and nurses. In fact, there are several healthcare careers that allow you to work closely with patients and make a difference. Let’s take a closer look at two of these commonly confused careers: medical assistant versus patient care technician. We examined the essential information about each position so you can make an informed decision about which suits you best. So pay close attention to this side-by-side comparison of these in-demand healthcare careers. A medical assistant (MA) is like a jack-of-all-trades in a medical office. They’re trained in both clinical and administrative work, with responsibilities in both the examination room and the front office. The clinical side of medical assisting involves recording vital signs, compiling patients’ medical histories and administering medications under the direction of a supervising physician. Administrative duties include greeting patients, scheduling appointments and assisting patients in completing insurance forms. A patient care technician (PCT) is mainly focused on working closely with patients, in conjunction with nurses. PCTs, sometimes referred to as nursing assistants, help perform basic care for patients, such as assisting them in using the restroom, serving meals or changing bedding. They may also monitor vital signs and provide emotional support to patients and families. The Bureau of Labor statistics (BLS) used real-time job analysis software to examine nearly 106,000 MA and PCT job postings from the past 12 months. * The data helped identify the top eight skills employers are seeking from candidates in each position. It’s clear that the skill set required for each job is quite different, as it should be, given the job differences. But don’t be intimidated by these lists of abilities. These are precisely the skills you’ll acquire during your education and training. The medical field hosts a variety of careers featuring a whole spectrum of educational requirements. The good news is the qualification for both MAs and PCTs require a fairly minimal time commitment compared to other healthcare careers. While MAs aren’t required to earn a college degree, most graduate from some type of postsecondary program, according to the Bureau of Labor Statistics (BLS). A typical medical assisting diploma program can be completed in as few as 12 months. To become a PCT, you’ll need to have a high school diploma and complete a training program, according to the BLS. After completing a training program, or acquiring equivalent work experience, you can become a certified patient care technician/assistant (CPCT/A) by passing an exam. Once employed, you’ll likely be required to undergo some sort of on-the-job training as well. As an MA, your duties begin when you check a patient in and end when you help him or her schedule their next appointment. In between, you may lead them to the exam room, register vital signs and record medical history. After they’ve been seen by the nurse or physician, you may be responsible for explaining medications or drawing blood for testing. Location and hours depend on where you choose to work. The BLS reports that a majority of MAs work in physicians’ offices, meaning they generally have regular, 9-5 work hours. This can be a big advantage if you have commitments outside the workplace. PCTs don’t have as many behind-the-scenes duties as MAs. Your primary focus would be on your patients, under the supervision of nursing staff. Your duties would largely depend on patient needs. You may have to change a patient’s bandages, collect bodily fluids for testing, document patient behaviors and assist them during mealtimes. You’ll also need to ensure hospital rooms are up to standard, with fresh linens, supplies and sanitation. Most PCTs are employed in nursing homes or hospitals, according to the BLS. Because those locations operate around the clock, chances are good that you’ll have to work nights and weekends. The nature of these facilities will also provide you more of an opportunity to develop meaningful, long-lasting relationships with your patients. The median annual salary for an MA in 2014 was $39,960, according to the BLS. It’s also expected that positions for MAs will increase 29 percent through 2022, which is much faster than the average for all occupations. The BLS attributes the growth to an aging population that will put more demand on doctors, who in turn will need more assistants. It’s also projected that MAs will begin to replace workers like licensed practical nurses (LPNs), who are more expensive to employ. In contrast, PCTs earned an average salary of $35,100 in 2014, and the number of jobs are expected to grow 21 percent through 2022. Like MAs, this faster-than-average job growth is attributed to an aging population who will inevitably have more healthcare needs as they grow older, the BLS says. PCT jobs aren’t expected to grow as MA jobs because places like nursing homes are funded by the government and thus the number of jobs depends on the funds available, according to the BLS. The comparisons provided above should give you a better understanding of a medical assistant versus patient care technician. Both positions will allow you to work directly with patients while playing an important role in the healthcare system. When you visit the doctor’s office, it’s likely that you will encounter medical assistants, as they are an essential part of any healthcare team. The office work (answering phones and filing paperwork) and hands-on (drawing blood samples and prepping patients), medical assistants keep healthcare offices running smoothly. Most medical assistants work standard 9-to-5 hours, which makes it an appealing career for those wanting to keep more regular hours than typically found in the healthcare industry. The medical assistant career field is one of the fastest growing in the healthcare sector. Because of an aging baby boomer population, the Bureau of Labor Statistics estimates a staggering 29% growth from 2012 to 2022. Though not required in most states, a diploma or certificate frequently makes a medical assistant more appealing as a potential hire, and also increases his or her potential entry salary. Practical experience and reduced on-the-job training mean that employers can hire with confidence. Another way to become more employable is by becoming a CCMA, or “Certified Clinical Medical Assistant.” To do this, one must take the certification exam of the National Allied Health Career Association (NHA) and renew this certification every year. One key aspect emerging in the medical assistant career is the need to understand electronic health records (EHRs). Having traditionally dealt with patient records in paper form, more and more medical assistants are required to learn new digitized interfaces. Although programs can vary from office to office, prospective employees should be aware that computer skills are increasingly becoming an intricate part of being a medical assistant. A career as a medical assistant appeals to individuals with strong organizational and interpersonal skills. On any given day, important files may need to be attended to, appointments arranged, and patients seen. Medical assistants are an essential part of any doctor’s office or clinic, and as such, responsibility and stress levels can be high. Ultimately, a career as a medical assistant can be a rewarding one. Also, becoming a medical assistant is a relatively simple process in terms of gaining employment in the healthcare field—and it can be a great stepping stone to becoming a nurse or even a doctor. When you visit the doctor’s office, it’s likely that you will encounter Certified Clinical Medical Assistants, as they are an essential part of any healthcare team. The Certified Clinical Medical Assistants keeps medical office running smoothly with performing administrative and clinical tasks. Most CCMA who willing to work during standard office hours, which makes it an appealing career for those wanting to keep more regular hours than typically found in the healthcare industry. Though not required in most states, a diploma or certificate frequently makes a skilled CCMA, and also increases his or her opportunity to hire. Practical experience and reduced on-the-job training mean that employers can hire with confidence. To become Certified Clinical Medical Assistant, a candidate must take certification exam of National Healthcareer Association (NHA). One key aspect emerging in the medical assistant career is the need to understand electronic health records (EHRs). Having traditionally dealt with patient records in paper form, more and more medical assistants are required to learn new digitized interfaces. Although work place and job description can vary from office to office, prospective employees should be aware that computer skills are increasingly becoming an intricate part of being a CCMA. A career as a CCMA suits to individuals with strong organizational and interpersonal skills. On any given day, important files may need to be attended to, appointments arranged, and patients seen. CCMA is an essential part of any doctor’s office or clinic, and as such, responsibility and stress levels can be high. Ultimately, a career as a CCMA can be a rewarding one. Also, becoming a medical assistant is a relatively simple process in terms of gaining employment in the healthcare field—and it can be a great stepping stone to becoming a nurse or even a doctor. I remember thinking several years ago when I was a clinical fellow student in nephrology department during my 4th year of Medical school in India and attending patient suffering from Chronic Renal Failure (CRF). There I had got opportunity to interact many patients who were on dialysis. I was always wondering and asking myself, “who has time to go to the hospital three days a week for four hours a day?” The answer: well, really sick people do. It is a daily decision to be positive. I saw this in some of the dialysis patients that I have met. Let’s start with explanation on dialysis. Dialysis is a treatment method that replicates the function of the kidneys when they are failing. In healthy individuals, the kidneys work to filter and remove waste products, excess fluid, salts and toxins from the blood. However, in cases of kidney failure, this mechanism fails and individuals need to undergo dialysis. Each of the two types of dialysis has advantages and disadvantages. The best suitable type of dialysis treatment is based on patient’s lifestyle, other medical conditions and support system. Patient and Nephrologist are working together to decide treatment responsibilities and participation in the treatment program he/she desires. A patient is receiving hemodialysis, by far the most common form of this therapy, sits at a clinic in a chair for three to four hours as her blood passes through a machine that eliminates waste products. Treatment is usually needed three times a week, and it can be exhausting and debilitating. You and your doctor will make the decision about when to start dialysis. Your kidney function (as measured by blood and urine tests), overall health, nutritional status, symptoms, quality of life, personal preferences, and other factors impact the decision regarding the timing of initiation of dialysis. Dialysis should begin well before kidney disease has advanced to the point where life-threatening complications can occur. If I had to give advice to any family facing dialysis treatments, I will advise them to understand what dialysis is, how it works, and how it affects the patient and make sure that the patient has the same knowledge. Usually it turns out that you have complementary knowledge. As the years go on you should know equally the when, how and why about dialysis and transplantation so that you can make future decisions which may become necessary with knowledge and understanding. Certainly, the patient must make all decisions in his/her treatment option as final analysis. However, families can involve in major decision discussions. When you select career in healthcare industry, you may come across a job called a Patient Care Technician (PCT). Many of you want to know more about Patient Care Technician. If you are one of them, details on PCT career are as follows. A Patient Care Technician (PCT) is a Jack of many trades. PCT can act as Certified Nurse Assistant (CNA), Phlebotomist and even Electrocardiographic (EKG) Technician. In current economy, we want to select career which has multiple dimensions. A Patient Care Technician can perform the same job as 3 different healthcare workers! Needless to say, this career field is growing, and growing FAST! There are 3 main focuses that a Patient Care Technician is responsible for. First, a PCT has the knowledge and training of a CNA. However, they differ from a CNA in the manner that they can provide advanced care in the territories of rehabilitation, pediatric care, obstetric care, psychiatric care, urinary care, wound care, and much more! And that is just scratching the surface. Second, a PCT can provide phlebotomy services that their patients may require. PCTs are experienced in venipuncture techniques and can be responsible for obtaining blood, urine and other specimens from patients. Finally, a PCT performs electrocardiographic testing. A PCT can conduct rhythm and 12 lead EKG testing, as well as, evaluating and interpreting electrocardiograms. Most PCTs that are rewardingly employed are nationally certified. The National Health Career Association certifies Patient Care Technicians and is a destination for information on the career. PCTs are employed in many different types of care institutions. PCTs can be found in most major hospitals and medical centers, long-term care, rehabilitation centers, dialysis clinics and more. Chronic tobacco consumption & addiction is a leading cause of heart disease, cancers, disability, and most deaths from chronic diseases in the United States. According to the facts by Center for Disease Control and prevention (CDC), cigarette smoking is the main reason for more than 480,000 premature deaths in the United States each year. Moreover, about 1 in every 5 death and 16 million people suffer with a serious illness in the U.S.A. In addition, secondhand smoking is equally responsible. Approximately 41,000 non-smokers die from diseases which are caused by secondhand smoking. According to the CDC, tobacco consumptions are having consequences like cancer of the lungs, throat, and mouth, heart disease, stroke, and chronic lung disease like emphysema, asthmatic bronchitis, and Raynaud’s disease. Various forms of tobacco products are consumed, such as cigars, cigarettes, pipe tobacco, snuff, bidi, tobacco pan, and chewing tobacco. Tobacco contains Nicotine which is having addictive property. When tobacco products are consumed in any form, nicotine is absorbed into the bloodstream. Nicotine stimulates the Adrenal Glands in our body which forces to release the hormone known as ‘Adrenaline’. Adrenaline stimulates the Central Nervous System (CNS) of our body and results in increase blood pressure, respiration, and heart rate. Having withdrawal symptoms including headache, yawing, nausea, constipation, insomnia, lack of concentration, anxiety, and depression. Addicted person has to smoke or chew after every meal. He cannot stay for long period of time without using tobacco. During time of stress, person needs tobacco to feel good. Many of addicted persons are willing to quit tobacco. Some individual among them has succeeded to quit tobacco without any medical help and many smokers need assistance to quit tobacco smoke. Now days different therapeutic approaches are being taken place to quit tobacco, such as Nicotine Replacement Treatments, Medication approach, and cognitive-behavioral therapy. As per CDC, certain tips are useful to quit tobacco. Find reason to quit tobacco, such as protect family, create healthy family environment, and need good health. Make commitment and effort to quit smoking. Get aware of withdrawal symptoms and get help with nicotine addiction treatment. Use of nicotine gum and nicotine patch, as per medical supervision. Disclaimer:The information provided in this article is for educational purpose only. This is just sharing of information, which we believe would be beneficial to the reader for improving his or her knowledge on various health issues. It does not serve as a replacement for medial consultation. The reader is solely responsible for use of these materials by any means. We strongly recommend that a qualified health care professional be consulted to decide on what is appropriate.